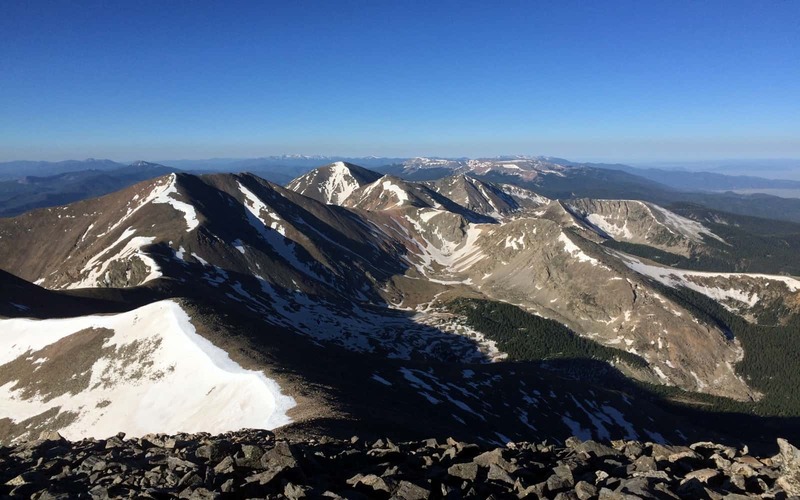 Anyone with the goal of climbing all of Colorado’s 54 14,000-foot mountains knows that Culebra Peak can be one of the more difficult “14ers” to check off the list. For experienced climbers, the hike to the 14,047-foot summit is not the primary challenge—the route traverses relatively moderate terrain and requires a round-trip hike of around five miles with 3,000 feet of elevation gain. The main obstacle involves legally accessing the mountain, because it lies in the heart of the 83,368-acre Cielo Vista Ranch, making Culebra Peak the only privately owned 14er in the United States. Earlier this week, I had the pleasure of touring the property with my Mirr Ranch Group colleagues and listing brokers Jeff Hubbard and Pat Lancaster. Between the two of them, Jeff and Pat have over four decades of experience on the ranch, mostly through guiding hunting trips throughout the property’s 100 square miles in pursuit of trophy elk, deer, and bighorn sheep. Throughout the tour their expertise and understanding of the ranch was abundantly evident, and in just over nine hours we managed to cover dozens of miles, explore four distinct ecosystems, and spot an impressive array of big game. After dropping our clients off in the nearby town of San Luis, I grabbed some dinner and headed back to the ranch for a good night’s sleep and an early morning ascent of Culebra. At 5:30AM the next morning, I was headed up the western slope of the mountain, most of which was still completely covered by a dense snowfield. The night’s cold temperatures had frozen the snow solid, making it firm enough to walk on without punching through. Rather than hiking up the rocky, more gently sloping flank of the mountain, I chose to save time and head straight up the snowfield, using my trekking poles for added propulsion. After almost 1,700 feet of elevation gain in just over 1.25 miles (steep! ), I made it to the first ridgeline. As is the case on most high altitude ridges in the early morning, the wind was ripping, making the mid-40 degree temperatures feel much colder. After donning gloves and a hooded wind jacket, I cruised along the ridge toward the false summit located about a mile to the east. Although the snow was stable and the ridgeline was relatively wide, the strong winds forced me to pay a little closer attention to each step—I wanted to ensure that I didn’t clumsily end up at the bottom of one of the pristine alpine lakes 2,000 feet below. From the false summit, it was another 1/3 mile along the ridge to the true summit, where I took some photos, hid from the wind behind a boulder, and enjoyed a Snickers bar breakfast. From the summit, I could identify many of the Cielo Vista’s eighteen 13,000-foot peaks, and I could also see multiple drainages that contribute the ranch’s 100+ miles of creeks. It is also worth noting that there was elk sign as high as the false summit, something that I have never noticed at that altitude on public land and speaks to the quantity of elk that reside on the ranch. I made decent time on the way up, but my trip back down was one of my fastest ever. After hiking down the ridge and back to the top of the snowfield, I simply sat down in the snow, pushed off, and glissaded (slid on my backside using poles for brakes) down almost the entire 1,700 vertical feet. I’ll take a fun glissade over a knee-pounding hiking descent any day! After my extensive tour of the ranch and my solo trip up Culebra, there’s no doubt that Cielo Vista Ranch is the most spectacular private property I have ever visited. Even with its irrigated meadows and grazing potential, the term “ranch” doesn’t accurately or fully describe the property. It is more akin a National Park or a 100-square mile wilderness area—pristine landscapes, dramatic topography, steep mountains, alpine lakes, healthy timber and abundant wildlife, all located on exclusive deeded land that is not accessible to the general public. Thanks again to Jeff and Pat for the fun and productive tour and for giving me the chance to finally check Culebra Peak off my 14er list!